Photographs of memorials in the Liverpool area. If you have any not listed here then we would be glad to add them to the site. The two sides of the Merchant Navy Memorial. Located at the Pier Head waterfront area. Belgian and Netherlands Merchant Navy Memorials. Located at the Pier Head waterfront area. Merchant Navy WW2 memorial. Located at the Pier Head Waterfront. Close up of the memorial and one of the globes that strides the enterance. Captain Walker memorial. Looking out to sea, Pier Head area. 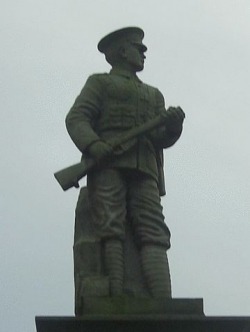 Prescot Great war memorial. Located behind St Mary's church in Prescot. The memorials at St Georges Church Heyworth Street Everton. Including St Augustine and St Timothy war memorials. Submitted by Amanda Robinson. WW1 board taken from the Liverpool Seamen's Orphanage after it closed. Now in the hands of the Museum of Liverpool Life. BRODIE.W-Pilot 3rd Class, ss Alfred H. The pilot vessel hit a mine at the Mersey Bar on 28 Dec 1917 and sank with the loss of over 30 lives. DEAN, JH-Private, 19th Battalion , KLR [Pals] Dean’s entry on the CWGC register notes him as an Old Boy of the Seamen’s Orphanage.